"Kosho’s St. Kuya shows the holy man in the act of recitation. In striking contrast to the realistic figural representation, the artist has added a more conceptual element to the work. 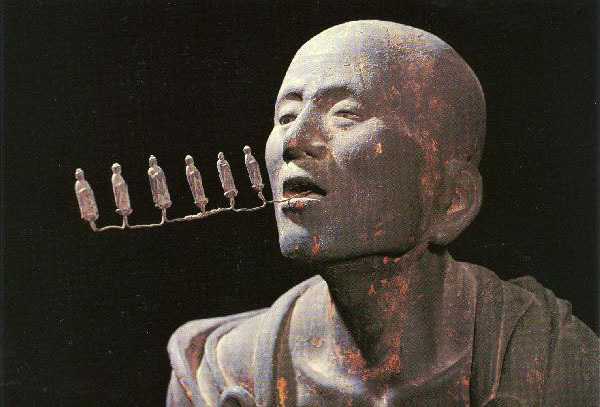 The syllables of the nembutsu—namu Amida butsu (meaning 'Praise to Amida Buddha')—are given physical substance in form of six small buddhas that emerge from the statue’s mouth. 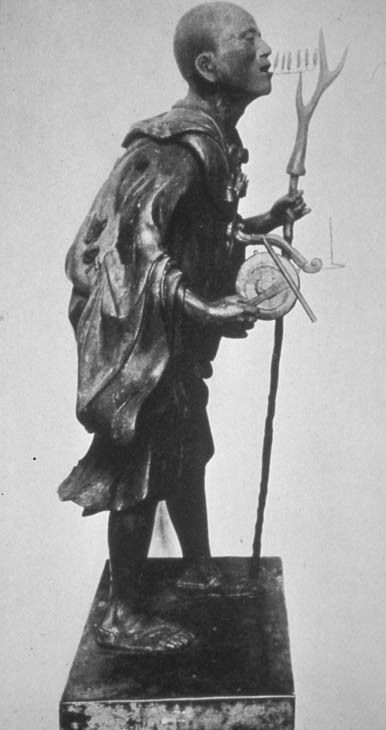 Paradoxically, the contemporary viewer would have identified the figure not by his carefully rendered face (which could not have been based on Kuya’s actual features), but by the presence of these visualized syllables, along with his traveling attire and gong. In the context of the temple, the manifestation of the recitation serves other purposes as well. It both attests to Kuya’s own salvation and acts as a model for temple worshippers, allowing the saint to continue teaching even in death."